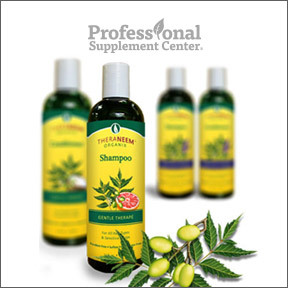 Professional Supplement Center is proud to announce the addition of Theraneem® Naturals, a comprehensive line of neem-based body care products. Medicinal benefits of the neem tree have been well known in India for over 4,000 years, where all parts of the tree are used for their valuable antibacterial, antifungal, antiviral, antihistamine and antiseptic properties. Since 1998, Organix® South has had to mission to provide earth-friendly, wholesome, and natural neem-based products for families and their pets. These paraben-free and phthalate-free products contain botanically pure, therapeutic grade herbal ingredients, rich in antioxidants and essential fatty acids that help to protect and nourish the skin, hair and scalp. Organix® South is committed to promoting organic, fairly-traded, ethically and sustainably sourced, high quality herbal products that contain no artificial ingredients or colorings. All herbs are tested to ensure botanical purity, strength and efficacy. Theraneem® products are cruelty free, earth friendly, and appropriate for the entire family. Facial Complexion Cleansing Bar – Hand-crafted with only the finest quality organic oils, this facial and whole body soap moisturizes, nourishes, soothes and protects all skin types, including sensitive and chronically dry or itchy skin. Gluten, paraben and sulfate free formulation. Also available: Kids and Babies Cleansing Bar for sensitive children and infants. Kids Neem Toothpaste Tropical Blast – This extra gentle formula for teeth and gum tissues contains supercritical extracts of neem, sweetened with xylitol and natural pineapple flavoring. Twigs from the neem tree are traditionally used to clean teeth in India. Gluten, paraben and fluoride free formulation. No artificial colors or flavors. Pet Shampoo – This extra gentle, soap-free pet shampoo is appropriate for both dogs and cats. Formulated to cleanse and revitalize the skin and coat, this shampoo cleans without harsh chemical or synthetic ingredients. pH balanced, paraben and phthalate free. Moisture Therape Shampoo – This hydrating and repairing shampoo contains organic neem oil, neem leaf extract, nourishing calendula and refreshing lavender to help seal in essential nutrients lost due to stress, sun exposure, chemical treatments and aging. Safe for color treated hair. Gluten, paraben and phthalate free formulation. Also available: Extra gentle Kids Therape Shampoo/Bodywash for sensitive eyes, skin, hair and scalp. Moisture Therape Conditioner – This moisturizing, hydrating and repairing formula restores moisture to the hair and scalp, helping to reduce split ends and leaving hair soft and sleek. Ingredients include organic neem oil, neem leaf extract, jojoba oil, panthenol and rice proteins to soothe dry or damaged hair and sensitive scalps. Gluten, sulfate and paraben free. Also available: Kids Therape Conditioner extra gentle formula for sensitive eyes, skin, hair and scalp. This entry was posted in Home and tagged Facial Complexion Cleansing Bar, Kids Neem Toothpaste Tropical Blast, Moisture Therape Conditioner, Moisture Therape Shampoo, Pet Shampoo, Power Greens Premium Berry by NuMedica, Professional Supplement Center, Theraneem Naturals by Organix South, Vitamins and supplements, www.professionalsupplementcenter.com. Bookmark the permalink.